Postcard from Naples 7 - No problems here. We have all the ingredients for a quick and easy ID and date: the principals in the photo are well-known, to say the least. The event was well-known and was covered by newspapers throughout the world at the time, and there is even a description and postmark on the back of the card (not shown). There are some interesting points about the event, the photo and card. The article, itself, described the exercise as a seven-hour "series of naval impressions unique in naval history" and the greatest naval demonstration anywhere in the world since the end of the Great War. There were 190 ships involved on a calm sea under clear skies in the Bay of Naples. Forty-eight sea-planes launched from the decks of warships and 72 others were sent aloft from land stations. There were also 14 passenger liners in the bay carrying leading persons in Italian society. Thousands watched from the shore. Indeed, the city went wild in its enthusiasm for the Führer from his arrival at the Mergellina train station, along his parade route and to a ceremony at the Royal Palace. 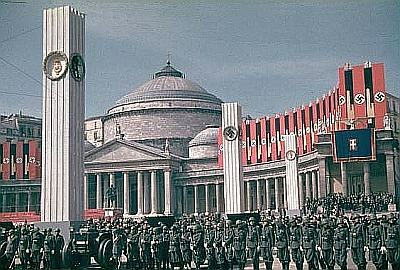 The adjacent square, Piazza del Plebiscito (pictured), was decked out in Nazi and Italian Fascist symbols. Hitler went back to Rome the next day. The only thing that caused some consternation at the time was his behavior at the opera. He sat with the king in the royal box for a performance of Aida, but did not extend his Nazi salute during the playing of the "second" German national anthem, the Horst Wessel Song. Very unusual, commented the NYT reporter. Also, at the end of the opera, cast members stepped out on the stage and applauded him. Adolf should have stepped forward to acknowledge the applause. He didn't. No one knows why. In any event, the naval display does not appear to have been another of Mussolini's Potemkin village affairs just to impress Hitler; that is, some sources (The Italians by Luigi Barzini) claim that in Rome a few days earlier, entire sections of the city had been fabricated like movie sets from cardboard and wood to make Rome seem more modern than it was. Barzini further cites the Roman dialect poet Trilussa (pen name of Carlo Alberto Salustri (1873-1950) who famously wrote: Roma de Travertino, refatta de cartone, saluta l'imbianchino, suo prossimo padrone. (Rome of travertine [limestone], remade from cardboard, greets the house-painter, her next master.) 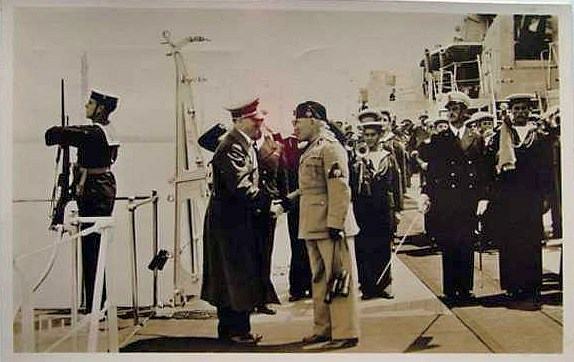 The extravaganza on the bay of Naples was the real deal, just to impress Hitler. And it did. Other remnant tidbits of the visit remain: for example, this large statue of Nicola Amore was moved to facilitate Hitler's motorcade. It still stands at the other end of town, collecting bird droppings.